An imine (/ᵻˈmiːn/ or /ˈɪmɪn/) is a functional group or chemical compound containing a carbon–nitrogen double bond. The Nitrogen atom can be attached to a hydrogen (H) or an organic group (R). If this group is not a hydrogen atom, then the compound can sometimes be referred to as a Schiff base. The carbon atom has two additional single bonds. In terms of mechanism, such reactions proceed via the nucleophilic addition giving a hemiaminal -C(OH)(NHR)- intermediate, followed by an elimination of water to yield the imine. (see alkylimino-de-oxo-bisubstitution for a detailed mechanism) The equilibrium in this reaction usually favors the carbonyl compound and amine, so that azeotropic distillation or use of a dehydrating agent, such as molecular sieves or magnesium sulfate, is required to push the reaction in favor of imine formation. In recent years, several reagents such as Tris(2,2,2-trifluoroethyl)borate [B(OCH2CF3)3], pyrrolidine or Titanium Ethoxide [Ti(OEt)4] have been shown to catalyse imine formation. ↑ C. F. H. Allen, F. W. Spangler, and E. R. Webster "Ethyleneimine" Org. Synth. 1950, volume 30, 38. doi:10.15227/orgsyn.030.0038. ↑ Reeves, Jonathan T.; Visco, Michael D.; Marsini, Maurice A.; Grinberg, Nelu; Busacca, Carl A.; Mattson, Anita E.; Senanayake, Chris H. (2015-05-15). "A General Method for Imine Formation Using B(OCH2CF3)3". Organic Letters. 17 (10): 2442–2445. doi:10.1021/acs.orglett.5b00949. ISSN 1523-7060. ↑ Morales, Sara; Guijarro, Fernando G.; García Ruano, José Luis; Cid, M. Belén (2014-01-22). "A General Aminocatalytic Method for the Synthesis of Aldimines". Journal of the American Chemical Society. 136 (3): 1082–1089. doi:10.1021/ja4111418. ISSN 0002-7863. ↑ Collados, Juan F.; Toledano, Estefanía; Guijarro, David; Yus, Miguel (2012-07-06). "Microwave-Assisted Solvent-Free Synthesis of Enantiomerically Pure N-(tert-Butylsulfinyl)imines". The Journal of Organic Chemistry. 77 (13): 5744–5750. doi:10.1021/jo300919x. ISSN 0022-3263. ↑ Mandler, Michael; Truong, Phong; Zavalij, Peter; Doyle, Michael (Jan 14, 2014). "Catalytic Conversion of Diazocarbonyl Compounds to Imines: Applications to the Synthesis of Tetrahydropyrimidines and β-Lactams". Organic Letters. 16: 740–743. doi:10.1021/ol403427s. ↑ W. J. Middleton and H. D. Carlson (1988). 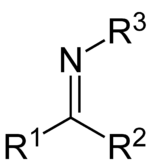 "Hexafluoroacetone imine". Org. Synth. ; Coll. Vol., 6, p. 664 . ↑ Koos, Miroslav; Mosher, Harry S. (1993). "α-Amino-α-trifluoromethyl-phenylacetonitrile: A potential reagent for NMR determination of enantiomeric purity of acids". Tetrahedron. 49 (8): 1541–1546. doi:10.1016/S0040-4020(01)80341-0. ↑ Moureu, Charles; Mignonac, Georges (1920). "Les Cetimines". Annales de chimie. 9 (13): 322–359. Retrieved 18 June 2014.